Considering President Trump’s decision on withdrawing United States from Iran nuclear deal, we would like to attract your attention to a survey IranPoll conducted among a representative sample of Iranians in the middle of April 2018. The survey was designed to track the trends on some of the previously asked questions regarding Iranian people’s attitudes toward the nuclear deal and Iran’s state of economy. The survey shows that an increasing majority of Iranians are saying that Iran’s economy is bad and that it is getting worse. And increasing majority also say that the nuclear deal has not yet been able to improve the living condition of ordinary Iranians. These perceptions have taken a toll both on President Rouhani and the JCPOA’s popularity in Iran. While both still enjoy a majority support; support for both is at an all times low. Iranians almost unanimously say that they have no confidence in the United States to live by the terms of the nuclear agreement and think that because of US pressures, European countries have been hesitant to trade and invest in Iran. Confidence in other P5+1 countries to uphold the deal has also dropped since Jan. 2018. In response to a question asking what Iran should do if the United States violates the agreement, a growing majority say that Iran should retaliate by restarting the aspects of its nuclear program that it had suspended as a result of the JCPOA. Telephone interviews of 1,003 Iranians were done April 13–17, 2018. The margin of error was +/- 3.1%. It was a nationally representative survey using our standard probabilistic sampling as detailed here. Below please find the results of this survey in greater detail. Also, the PDF version of this survey is available here. Mundiario Spain: Quién pierde más con la ruptura del acuerdo nuclear de Irán? Lobelog: Iran’s Future: Hybrid Nationalism? In this study, Iranians identify a total of 434 distinct brands across 15 major sectors, including Food, Hair Products, Audio-Video Products, Large Home Appliances, Small Home Appliances, Cosmetics, Automobile, Motor Oil, Clothing, Cellphones, and Pharmaceuticals. According to a recent survey conducted by IranPoll.com, an overwhelming majority (85%) of Iranians believe that growing trade and business tie between Iran and other countries is either very (31%) or somewhat (53%) good for Iran. A large but smaller majority (57%) of Iranians also believe that an increase in import of foreign made goods would be very (13%) or somewhat (44%) beneficial for Iran’s economy. The nationally representative survey was done by IranPoll.com - an independent full-service opinion research and consultancy firm in Toronto, Canada, focusing exclusively on Iran - in partnership with Tehran Bureau - an independent news organisation, hosted by the Guardian. The sample of 1,003 Iranians were surveyed using telephone polling between the dates of 2-11 October 2015, giving a sampling margin of error of +/- 3.2%. Tehran Bureau has published an article on this poll available on the Guardian here. Survey also included a comparative question about openness to foreign trade that Pew Research Center has been fielding in 59 countries since 2002. Based on this comparison, Iranians are more open to foreign trade than Americans, French, Japanese, Italians, Russians, and Indians. In addition, Iranians are equally in favor of foreign trade as Canadians and the Swedes. Survey also found that 90% of Iranians expect a lot more foreign companies making investments in Iran and 58% believe that an increase in import of foreign made goods would be beneficial for Iran's economy. Among various countries with which Iran can develop its trade relations, Germany is the most favored. In total, 61% like to see Iran developing greater trade relations with European countries. The survey shows considerable opening to multinational companies considering to enter Iranian’s market. Iranians give high marks to German and Japanese goods. An overwhelming majority (91%) of Iranians believe that Germany produces high quality goods (91%), followed closely by Japan (89%), France (88%), South Korea (83%), USA (79%), Italy (79%), and the UK (74%). Chinese and Indian products get the lowest quality ratings from Iranians; with two in three (66%) Iranians believing that the quality of Chinese goods is at least “somewhat bad” and a plurality (46%) regarding Indian goods to be of inferior quality. 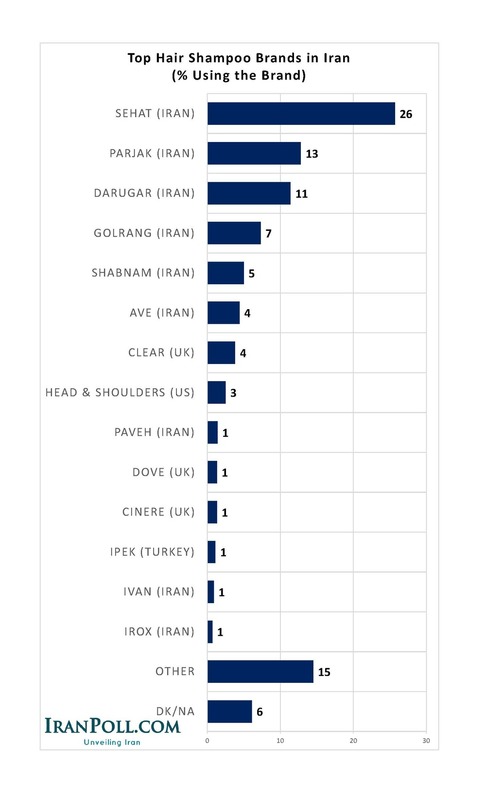 The survey finds cosmetics to have the most crowded competition with Iranian consumers naming a total of 107 distinct cosmetic brands from 25 different countries. In this study, Iranians named a total of 434 distinct brands from across 15 major sectors, including Food, Hair Products (64 brands from 7 countries), Audio-Video Products (31 brands from 10 countries), Large Home Appliances (87 brands from 13 countries), Small Home Appliances (67 brands from 14 countries), Cosmetics (107 brands from 25 countries), Automobile (25 brands from 9 countries), Motor Oil (18 brands from 5 countries), Clothing (from 16 countries), Cellphones (33 brands from 11 countries), and Pharmaceuticals. The study find that Iran’s hair products market is dominated by five Iranian brand of Sehat (26%), Parjak (13%), Garugar (11%), Golrang (7%), and Shabnam (5%). Yet, Iran’s home Audio/Video market is dominated by the two South Korean brands of Samsung (40%) and LG (26%) followed by Japan’s Sony (16%). While Iran’s large home appliances market is not captured by any one brand, South Korean brands of Samsung and LG do the best in that market as well. Samsung is named by 18% of the respondents and LG is named by 16%. Iran’s mobile phone market has many major players. South Korea’s Samsung does best with 36% of Iranians saying that they use a Samsung mobile device. Following Samsung, Finland’s Nokia (26%), followed by Japan’s Sony (10%), China’s Huawei (8%), America’s Apple (4%), Iran’s GLX (3%), South Korea’s LG (3%), and Taiwan’s HTC (3%) are the most used mobile phone brands. Finally, Iran’s auto market is fully dominated by two Iranian car producer with 48% of Iranians driving IranKhodro and 26% driving SAIPA. A nationally representative survey sample of 1,003 Iranians was conducted using telephone (CATI) between the dates of 2-11 October 2015, giving a sampling margin of error of +/- 3.2%. The sample was an RDD sample drawn from all landline telephones line in Iran. The sample was stratified first by Iranian provinces and then in accordance to settlement size and type. All 31 Iranian provinces were represented in proportions similar to their actual populations, as were rural and urban areas. The contact rate, defined as the proportion of respondents who were reached and ultimately agreed to be interviewed relative to the number of respondents attempted, was 72%. The completion rate was 83%. All of the interviews were conducted using computer-assisted telephone interview (CATI) in a centralized call center. All interviews were monitored in real-time by call-center supervisors and were recorded. For more on IranPoll.com's methodology please visit here. As difficult as it was for President Rouhani to secure a deal, it will be even more difficult for him to sustain popular support for it when all the excitement dies down. In a new poll that IranPoll.com, an independent Toronto-based opinion research firm, conducted for the University of Maryland, a majority (57 percent) of Iranians expressed support for the deal. Yet, the expressed support heavily rests on the assumption, held by most Iranians, that the deal will result in better access to foreign medicines and medical equipment (61 percent); significantly more foreign investment (62 percent); and tangible improvements in living standards (55 percent), all within a year. If these expectations are not realized quickly, Rouhani will be left with the unpleasant task of explaining who has pocketed the benefits of the deal and what Iran got in return for rolling back the nuclear program. This will be particularly difficult since 83 percent of Iranians think it is "very important" for Iran to continue developing its nuclear program and Rouhani would need to show that what Iran got in return was better. This level of Iranian support for Iran to develop its nuclear program has remained essentially unchanged across various polls conducted in Iran since 2006. The national telephone poll of 1,009 Iranians was conducted by IranPoll.com and University of Tehran Center for Public Opinion Research (UTCPOR) for University of Maryland's Center for International and Security Studies at Maryland (CISSM) on 12-28 May 2015, with a margin of error of 3.2 percent. With the deal, we need a few months after the implementation of the agreed processes by Iran and the west before the full effects of the lifting of the sanctions can manifest. At the same time, people are worn down by the pressures of the past few years and expect a swift resolution to the country's economic problems. The deal could introduce other problems for President Rouhani as well. Iran's economy suffers from many structural deficiencies that are mostly the byproducts of mismanagement and corruption. To this date, Iranian officials had the luxury of blaming Iran's sluggish economy on "unjust" foreign sanctions. The post-deal environment, however, will be different and Iranians are more likely to place the blame for Iran's underperforming economy on Iranian policymakers. With a diminished scapegoat, Rouhani will quickly come under increasing pressure to explain why he has not been able to turn things around. More significantly, Iran's economy is in dire need of foreign investment, particularly in its oil and gas sectors. While the Joint Comprehensive Plan of Action will lift many restrictions that were placed on such investments in Iran's economy, by no mean does it advocate such investments. To this date, the United States has been able to impose staggering fines on global financial institutions that have been found to evade US sanctions and the pain of these fines are not likely to be forgotten by banks for the years to come. With most US sanctions on Iran still in place and the snap-back provisions that are included in the deal, major multinational companies are unlikely to accept the risks of investing in Iran. The most likely scenario, considering Iran's impressive cash reserves held in foreign banks and a middle-class with an acquired taste for foreign goods, is that most companies would want to exploit Iran's market by selling their goods to Iran in return for fast risk-free cash instead of investing in it. While this will lower the cost of consumer goods in Iran, the competition is likely to force many Iranian industries into bankruptcy, resulting in higher unemployment rates. Of course, Iran could prevent this by introducing tariffs with equal effect of the sanctions, in which case the whole economic point of the deal would be lost. Still, the positive psychological effects of the deal, the initial catch-up effect of suppressed inherent development capacities of a well-educated 80 million strong population, and Iran's relatively unique stance as an unexploited large economy might help Rohani carry public support in the short term. In the long run, however, there is no substitute for effective governance and sound economic management. In a new survey of the Iranian public, a solid majority supports pursuing a deal on Iran’s nuclear program. When presented a summary of key points on which negotiators for the P5+1 have already reached an understanding with Iran, a clear majority (57%) expressed support for a deal under which Iran, for a number of years, would limit its centrifuges and nuclear stockpile to the level needed for nuclear energy and accept more extensive inspections by the International Atomic Energy Agency in return for the P5+1 accepting Iran to enrich uranium, lifting of economic sanctions, and expanding nuclear cooperation with Iran. Only 15 percent were opposed; another 28 percent were equivocal or did not know. Support for the deal may be complicated since attitudes about making a deal on the nuclear program are related to assumptions about whether all US sanctions would be lifted and how quickly Iranians would experience various benefits from sanctions relief. Currently 63 percent of Iranians assume that according to the understanding, all US sanctions on Iran are to be lifted eventually, not just those related to Iran’s nuclear activities. Only 23 percent believe that some US sanctions would continue. Asked what Iran’s position should be, 51 percent say that unless the US agrees to remove all of its sanctions, Iran should not agree to a deal, while 45 percent say Iran should be ready to make a deal that removes some US sanctions and all UN and EU sanctions. In this context, support for making a deal is substantially lower among those who believe that the terms of the understanding do not necessarily call for the US to remove all sanctions compared with those who believe that a final agreement would require complete sanctions removal (51% compared with 64%). Iranians also express high expectations that a nuclear deal, with the removal of sanctions, would produce significant effects within a year. Majorities say they would expect to see better access to foreign medicines and medical equipment (61%); significantly more foreign investment (62%); and tangible improvement in living standards (55%), all within a year. The telephone poll of 1,009 Iranians was conducted May 12-28, 2015, by IranPoll.com and the University of Tehran’s Center for Public Opinion Research working in conjunction with the Center for International and Security Studies at Maryland. The margin of error was +/- 3.2%. Read the full report of this study here.